Rothiemurchus Highland beef is the star of this dish that puts a fresh Spring twist on a classic dish. There are few things that feel more special than sitting down to a roast dinner with family or friends. 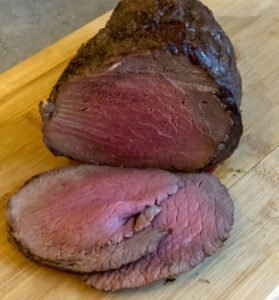 The first thing you will need to do is select the size and cut of beef that you want for your roast. 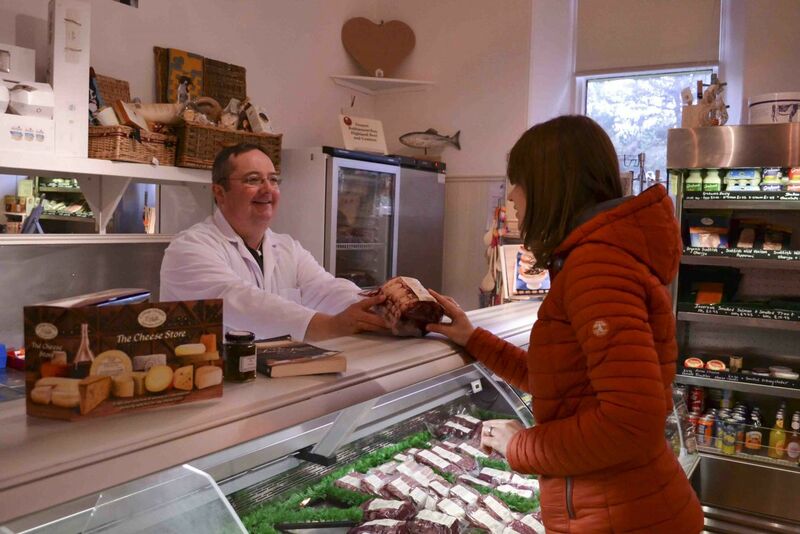 Our butchers and friendly farm shop staff are on hand to help you make the right choice and advise you on cooking times, which will be dependent on the size of the joint and whether you prefer medium-rare, medium or well done. 20 minutes per 500g for medium-rare. 25 minutes per 500g for medium. 30 minutes per 500g for well-done. To test you can pierce the meat with a skewer and the juices will run red for medium-rare, pink for medium and clear for well done. Remove the beef from the fridge about an hour before you want to start cooking. Allowing meat to reach room temperature before it goes in the oven ensures it will cook more evenly. Pre-heat your oven to 240°C/220°C fan/ gas mark 9. Season the fat on the outside of the joint with salt and pepper and a little flour, if you want to make a crust. Cut an onion in half and place in a roasting tin with the beef balanced on top. Roast for 20 minutes and then turn the oven down to 180°C/160°C fan/ gas mark 4 for the remaining cooking time. Allow to rest for at least an hour after cooking so the juices reabsorb. 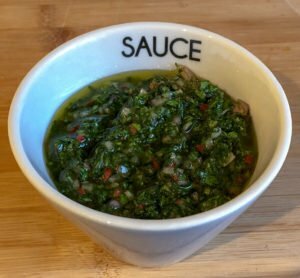 Chimichurri is a classic Argentinian sauce that most often accompanies steak although it also compliments many other dishes. 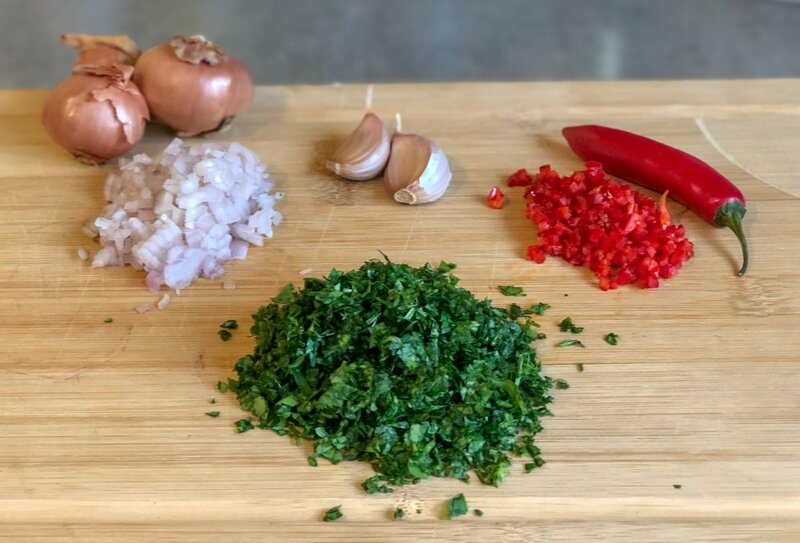 The basic ingredients of this sauce are garlic, parsley, onion or shallot, olive oil and an acidic component, either wine vinegar or lemon juice. Coriander, chilli and oregano are also often included so feel free to modify the recipe below to your own tastes. Wash the herbs and pat dry, finely chop and set to one side. Next mince the chilli, shallots and garlic and place in a bowl with the red wine vinegar and salt and pepper. Leave this mixture for about 10-minutes, the acid in the vinegar will mellow out the other flavours. Add the parsley and coriander and olive oil and allow it to sit for between 15 minutes and two hours to let the flavours infuse. In keeping with the fresher springtime vibe, new potatoes tossed in a little butter and chives replace the traditional roasties and green beans mixed the slow-roasted onion from the beef pan complete the dish. 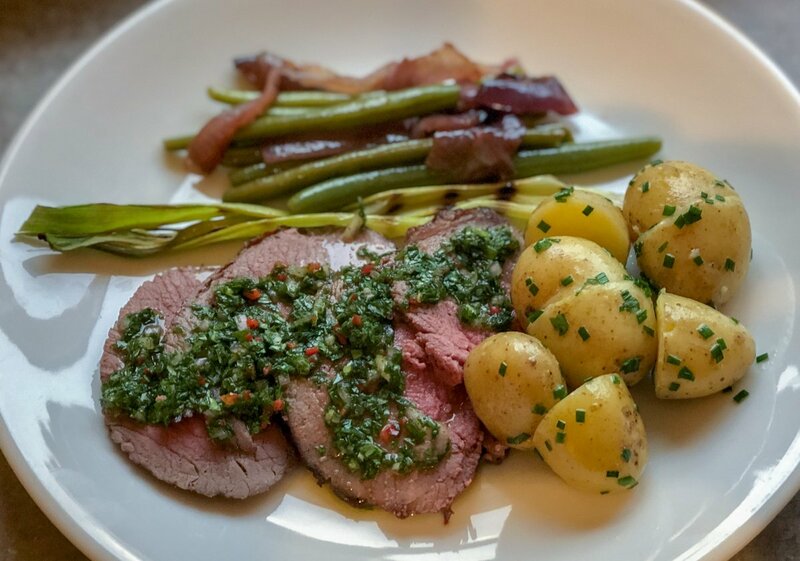 Roast beef with chimichurri, new potatoes and green beans.